A long-neglected industrial and manufacturing district in Hialeah could serve as a catalyst for new commercial and residential development in the blue collar, predominantly Hispanic city, according to elected officials. Hialeah Mayor Carlos Hernandez and City Councilman Paul Hernandez (no relation) discussed their efforts to attract transit-oriented, mixed-use projects and create an arts district in the east side of the city, during a luncheon on Thursday hosted by the Commercial Industrial Association of South Florida. To get developers interested in the area, the city and the Miami-Dade County Commission approved a new community redevelopment agency for 121 acres in east Hialeah so tax dollars are redistributed to public and private projects within the CRA boundaries. In the heart of the CRA’s area is the Hialeah Market Tri-Rail Station at 1200 Southeast 11th Avenue, which sits on an 462,363 square foot predominantly vacant lot. The city also approved master plans for transit-oriented developments near Hialeah Market Station and Tri-Rail/Metrorail Transfer Station at 1125 East 25th Street. Designed by PlusUrbia, the plans call for more residential and commercial projects, pedestrian-friendly streets, enhanced public space, taller building heights and reduced parking requirements. As a result, two developers have already submitted plans. The first, Bridge Crossings, is a seven-story mixed-use project totaling 71,116 square feet with 74 apartments and 1,100 square feet of ground-floor retail, about a block north from the transfer station linking Tri-Rail and Metrorail. The 22,318-square-foot former lumber yard is owned by A&B 2701 Investment LLC, which paid $85,000 for the property in 2014. Mitchell Sabina’s MS Development and L. Michael Osman are teaming up on a proposed six-story development a block west of Market Station and across from a Home Depot. The developers paid $1.8 million for the 1.14-acre site in 2014. Called Apogean Pointe, the project would entail 59 apartments, nine live-work units, 4,000 square feet of commercial space and 102 surface parking spaces. 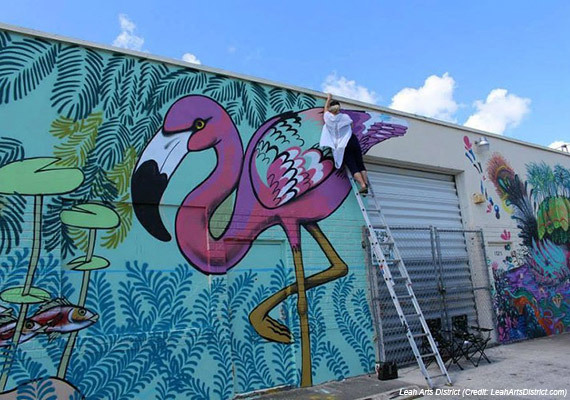 Paul Hernandez recapped his initiative to create the Leah Arts District, a swath of industrial warehouses and car shops in east Hialeah that can be converted to live and work spaces for artists priced out of Wynwood and other emerging neighborhoods in Miami. He pointed out the popularity of Flamingo Plaza, a shopping center offering a milieu of thrift stores and discount outlets popular with Miami millennials, as a driving force behind his idea. Kattan represented the seller of a 31,000 square-foot warehouse who got $96 a square foot. Located at 1395 East 11th Avenue in the Leah Arts District, the property is now home to Unbranded Brewing, a new craft beer joint set to open later this year.